Create your very own rustic Irish sign with a piece of bead board, a piece of plywood, some paints, some yarn, and some hot glue. Start by painting your plywood green and your bead board white. Once both elements are dry, glue your bead board onto your plywood to give it a framed look. After that, use your glue gun to outline the first heart shape of your shamrock and line the glue with your yarn. Continue outlining the heart until it’s filled in, then do the same for the other two. Add a stem and the word “lucky” and voila! Whether they’re for yourself, friends, or kids, shamrock ponytail holders are super easy to make. Simply cut two shamrock shapes out of a piece of felt, then use a needle and thread to sew green sequins onto the shape. When you’re done, use fabric glue to glue the second shamrock onto the back of the first. Sew an elastic hair tie onto the back and you’re ready for festive hair. Wreaths aren’t just for the holidays – you can make wreaths to celebrate any occasion! For this wreath, start by wrapping burlap fabric around a foam wreath form. Then, to create the flowers, cut out 9 peanut-shaped strips of fabric, pinch the center of each, and glue. Layer three shapes on top of each other to create a flower and secure. Finish each flower by gluing a festive button to the middle and a metal clip onto the back. Once they’re dry, clip them onto your burlap wreath an you’re done. Turn old glass bottles into a beautiful vase display with this craft idea. Rinse out old glass bottles of various sizes and let dry. Then, using a different color green acrylic paint for each, squirt some paint into the bottle and turn to coat. Once the whole bottle is coated, turn it upside down to drain out any excess. Let them sit upside down overnight to drain and dry fully. Make your own tags with craft paper, string, and sticker letters (you can make them say whatever you want!) and drape one over each bottle. Then, fill with festive flowers. Make these easy table decorations with green paper and a glue gun. You’ll need six strips of paper of various inch lengths: two 8 1/2, two 6 1/2, one 7 1/2, and one 5 1/2. Fold each strip in half and glue the fold together. Then, form each strip into a heart. Place the 6 1/2-inch hearts inside the 8 1/2-inch hearts and glue together. Do the same for the remaining smaller strips and place the last smaller heart in between the larger hearts. Bend the ends of the larger hearts to make a “stem” and wrap the stem in a small strip of paper to complete. Create one or several of these to hang on your mantel, staircase, bathroom mirror, and more. Start with cardboard cutouts that include three heart shapes and a “stem”. Cut green strips of fabric and glue them around the cutouts, then glue the cutouts together to create your shamrock. After that, create your paper discs from festive scrapbook paper and finish them with small shamrock accents. Once you have all of your elements done, glue them to a green piece of ribbon and hang. If you have some extra wood and green paint lying around, you can easily make a leprechaun hat for your front stoop. Cut a 2×4 into one 6″ piece and two 4″ pieces. Then, paint each piece green and let dry. Stack the two smaller pieces on top of the larger piece and glue them all together. After that, you can attach strips of fabric to the front of the hat or paint it with a lighter green paint. 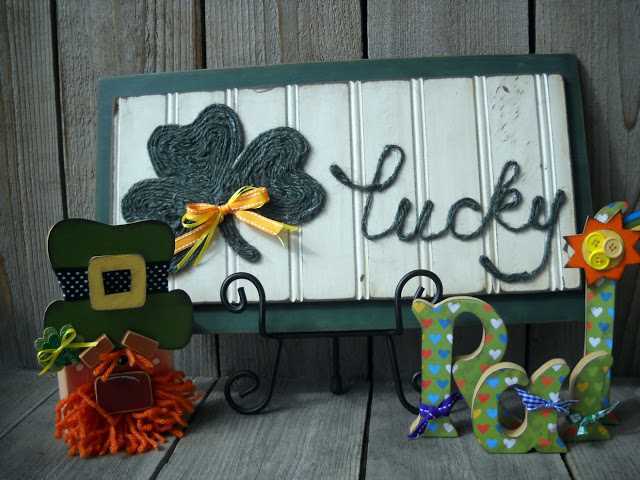 Attach a piece of ribbon and a shamrock and put it on display! Turn a simple pillow into a festive one with a burlap pillowcase, pillow insert, green felt, hook and loop tape, and some glue. Cut a large shamrock out of a piece of dark green felt and a smaller circle out of a piece of lime green felt. Place a dot of glue in the middle of the circle and fold in half. Then fold the sides in and glue together to form a flower and glue the flower to the shamrock. Attach a strip of hook and loop tape to the pillowcase and another to the back of the shamrock. Then, simply attach the shamrock and display on your couch or chair. This entry was posted in DIY and tagged crafts, DIY, holiday, sewing, yarn.